Creative Ideas: Repair or Re-Roof? Today, property owners need to explore creative methods to both understand the current condition of their buildings, determine the scope of work that has the greatest value - be it repair or re-roofing – and, most importantly, how to fund the project. As a starting point, property owners need to understand the existing condition of their roofing assets. The cost associated with delaying needed roofing work can prove to be far more expensive in the long run. Additionally, roofing a building that has a serviceable roof life - and needs repair work only - will unnecessarily deplete working capital. Property owners need to understand the service life of the roof and how to extend the roof life. A Roof Life Extension Program is one option to help building owners. Roofs are inspected and given an overall score that can be used to assist a building owner to help prioritize and budget for roofing services that address critical needs, delay re-roofing until necessary and develop a comprehensive program to help extend the life of the roof. In order for property owners to make more objective decisions, a Roof Life Extension Index ranking is developed to help prioritize budget allocations. Roof budgets can be developed for multiple years based on a combination of Index scores and the building owner’s actual roofing experiences with various systems and their performance history. Once an organization has developed a ranking of their roofing assets and understands the attention each roof in the portfolio needs, the next challenge is determining how to fund the project. Again, creativity and unconventional thinking are key. For example, consider a new cost-saving “cool” roof with upgraded insulation designed to reduce current energy loads. Add to that a long-term financing option and calculate the roofing investment payback period based on the overall energy savings. 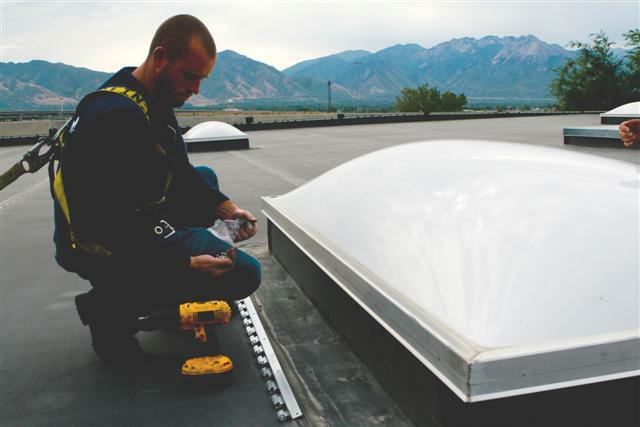 Daylighting (prismatic skylights and lighting technologies) that can significantly reduce electrical demand. The above options are environmentally friendly and they have the potential to save money. There are many federal and state tax incentives and utility rebates that you may be able to utilize. The actual roofing cost may be a fraction of the overall costs when you consider potential tax and rebate savings and the reduction of overall total energy consumption over time. Finally, consider loan options to help finance the project.